You won’t find any diary-like detailed descriptions of my travels here but some basic information about most of the trips I’ve done, like background, itinerary and the most memorable experiences. If you have any further questions please fill the contact form, I’ll reply as soon as possible. This was a 30 day packrafting adventure. The landscape along the route from Narsarsuaq via Aappilattoq to Tasiusaq is more beautiful than anything else I’ve seen in Greenland so far. We started off as a group of five, then after 14 days two more friends joined us. 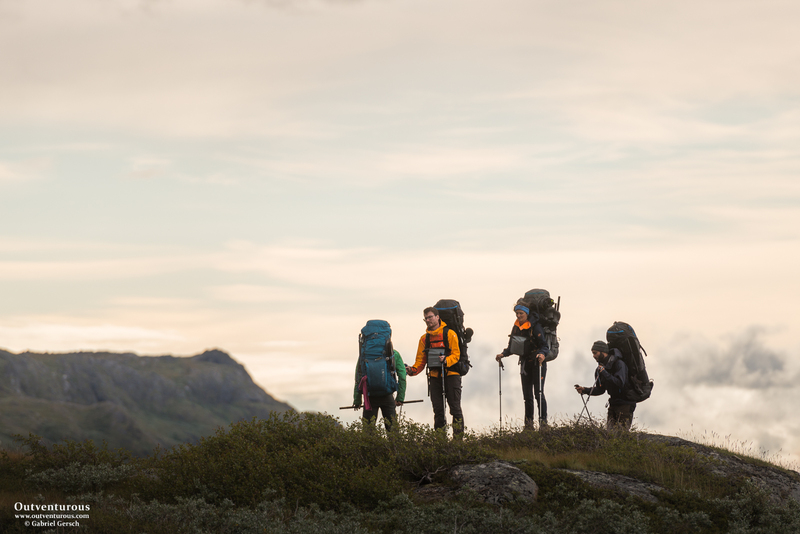 Together we explored the steep mountains, deep valleys and challenging passes of Greenland’s south. First, we explored the islands and peninsulas in the area around Uummannaq on foot and with packrafts. Our route led us 500 km north of the Arctic Circle, the terrain was rugged and had little vegetation. The fjords were full of icebergs and the Greenland ice cap in the east was visible most of the time. Later, we traversed the Nussuaq Peninsula and ended our trip in the village of Saqqaq. Wonderful packrafting adventure, even though it started with a few disappointments: Bad weather and insufficient fitness of a travel partner made us loose time and we had to change the route significantly. Soon after, I had an accident and needed to be evacuated by helicopter. The second part of the trip (Arsuk – Narsarsuaq) went well, although someone stole from our food cache and made us starve for a week. At the very end of the season, I spent another ten days alone in the area around Narsarsuaq and had time to relax and explore the region. An 8-day trekking trip in the Simien Mountains, including a climb of Rash Dashen (4,450 m), Ethiopia’s highest mountain, followed by a road trip through northern Ethiopia, the Danakil Depression and a climb of the volcano Erta Ale. Our good friend Zeeshan invited us to his home town Layyah in Punjab. With him we visited several places in central Pakistan and were introduced to his friends and family and many other Pakistanis who made sure we were warmly welcome. We hitchhiked to the town of Uis and explored the Ugab River and Brandberg area on foot, including Tsisab Valley and its ancient paintings. Later I continued north and hiked in the Twyfelfontein area, where I encountered plenty of wildlife and visited some famous rock engravings. After an incredibly adventurous road trip, my friend Katharina and I arrived at the Kunene River in Otjinhungwa (Marienfluss) in the very northwest of Namibia, right at the border to Angola. There we spent two magnificent weeks hiking through the desert, exploring some beautiful but inhospitable territory that most other tourists only see through the windshield of their cars, if at all. After a full summer of guiding clients in Alaska, I finally went on a personal trip through the eastern Alaska Range with my friend Keith. We started close to Fielding Lake on the Richardson Highway and crossed several rivers and glaciers on our way east. In a total whiteout we put on our snow shoes and hiked over a glaciated pass before we ended up on the north side of the range and followed the Robertson River all the way to the Alaska Highway. One week in a Public Use Cabin in Eastern Alaska and an overnight hike in the Hatcher Pass area in the Talkeetnas – this is how I spent the last ten days of September in Alaska. Together with a friend from Austria I traversed the Eastern Alaska Range from Healy to Black Rapids. Originally we had wanted to go all the way to Tok but due to a snowstorm in mid-September we had to cut our route short and returned to Palmer after crossing the Delta River at the Richardson Highway. In mid-September, when the first snow fell, I went on my last hike for this season. Starting in Eureka I went north, crossing several passes and rivers until I arrived at the Talkeetna River, where I put in my packraft. From there I wanted to raft all the way to the village of Talkeetna, but due to heavy floodings I had to fly out. Together with my friend Markus I hiked all along the Lebanese mountains in the winter time. In this I want to share some impressions we got concerning nature, culture, politics, religion and the people we met down there in the small and rarely attended country of Lebanon. Together with my friend Becky I spent two nights at Paxson Lake and hiked up Donnelly Dome. Then I floated down the Gulkana River in my Packraft until I got to Sourdough Camp. After a short road trip on the Denali Highway I started my this year’s Denali hike. From Eielson I crossed the Alaska Range at Anderson Pass, went eastwards for a few days, then crossed the range again and rafted down the Teklanika River. This trip ended with a visit at the “Magic Bus”. Second part of my journey through the Indian Himalayas in July 2011. After we returned from our hike in West Ladakh we continued our way to the high-laying Tsomoriri Lake and climbed Chamser Kangri (6600 m). This is part one of my journey through the Indian Himalayas in July 2011. After some acclimatization in Ladakh’s capital Leh my two partners and I took a bus to Lamayuru where we joined a festival and later did some nice hiking in nearby mountain ranges. In February 2011 I went on a solo trip through the Taurus Mountains in Turkey following the Lycian Way. Trekking there is easy and offers some nice and scenic views as well as cultural insights, although it wasn’t an actual “wilderness trek”. Unfortunately I got attacked by a dog after two weeks which brought me into the hospital, shortly after that I flew home. Part two of our 9-weeks long Alaska trip. Caused by illness we started our time in Denali with just a few shorter hikes and a few packrafting sequences, later we hiked over the Kesugi Ridge, before crossing the Alaska Range from the Park Road to Cantwell. Part one our 9-weeks long Alaska trip. Making use of packrafts and an air supplied food drop we hiked from Slana to McCarthy including a few side trips and a longer stay in the community of Chisana. Second Part of our 11½-weeks-trek through the Rocky Mountains. We spend 16 days hiking through Yellowstone, later we explored the Tetons further south. At the very end of our trip we hitchhiked through Idaho and Utah to spend some time in SLC before flying over to NYC and then back home.